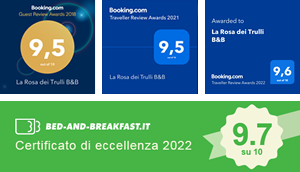 the Bed& Breakfast La Rosa dei Trulli opens doors to a relaxing stay. the tranquility that will instill and with the emotions that will give you. The reception is not sudden. Alberobello with its Trulli is one of the 54 Italian sites included by UNESCO in the World Heritage List.